Enjoy the waves, relax & watch the world pass by, Views as far the eyes can see. Amazing fantastic spectacular that describe the incredible sea, sand, city & island uninterrupted panoramic views that this property offers. This delightful two storey home situated in the prestigious Adare. Only a two minute walk to the beach & only a minute drive or short walk the main shopping precinct. The entry hall will take you to the slate tiled kitchen with separate dining area. Then on to the large lounge with sensational sea and island views. Move out on to the tiled balcony for even better views. Take the corridor to the master bedroom with bathroom access & the second bedroom is here as well. All bedrooms with built-in robes. Downstairs you will find two bedrooms, family room with access to second balcony. Rumpus room & separate bathroom. The laundry leads out to the secluded terrace/garden area. Perfect for reading that great book or entertaining the family. Quilts, pillows, & mattress protectors are supplied for all beds. Guests are asked to bring your own linen, however we can arrange linen for you at an additional cost. You don't have to decide right now, we can help you right up to a few days before you arrive in relation to this issue. Full sized laundry, front load washing machine, clothes dryer, an outside clothes line, iron & ironing board, full size laundry tub. In addition to the upstairs fridge/freezer there is a 180L chest freezer available to use. Outside you can enjoy the outdoor under cover entertaining area with a six burner BBQ with side burner, outdoor table furniture with umbrella or move to the front deck. Eco Friendly house solar panels and solar hot water systems, Reverse cycle air-conditioning, Two LED colour TV's DVD/CD player, X-Box console with games, Soccer table, Other games including board games for the whole family to enjoy. There is a strict NO PARTY policy. The house is located in a residential area and public disturbances will not be tolerated, our neighbours will report issues such as excessive noise or uncontrollable barking from pets. Guests will be asked to leave the premises without notice should noise or nuisance complaints be received or if the number of guests exceeds the number at time of booking. Sorry No Smoking inside the house, Strictly No Pets. but must be confirmed with owner. The house should be left neat & tidy as per when you moved in, any extra cleaning required to return the house to original condition will be deducted from the bond. Victor Harbor is a short one hour drive from Adelaide. The property is only minutes from the town centre. It is the perfect holiday destination for those wishing to escape from city life. Enjoy sitting back either inside or outside this beautiful house taking in the magnificent land/sea views. 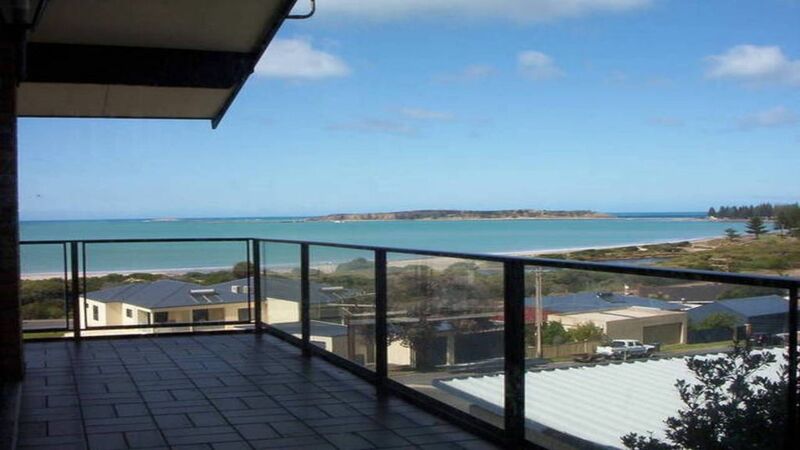 You can spend your days reading, fishing, walking/cycling the many trails, surfing, day trips to Cape Jervis, Port Elliot, Middleton, Goolwa, McLaren Vale exploring or just taking in the beautiful views. There are numerous cafes, wineries and shops to explore during your stay. Friendly service from Maria and a great property with many features!